Just because a band is only together for a short amount of time, doesn’t mean they can’t achieve their goals and dreams. Some groups toil away for decades and never quite find that right balance of good music popular enough to move the needle. Today’s band struck early and often, lasting a short amount of time, but getting all the accolades the three-decade band could ask for. In October of 2000, Rage Against the Machine’s lead singer announced he was moving on from the band. Undeterred, the remaining three members wanted to stick together and search for a new frontman. The band began tryouts, and found themselves going in a similar direction as their former lead singer, but after careful consideration, they decided to move toward a whole new sound. It was music producer Rick Rubin that suggested they give former Soundgarden singer Chris Cornell a call, and see if their styles would blend. Rubin believed as good as Rage was, Cornell would make the group an even better version. The band was skeptical, but the chemistry was immediately apparent. Guitarist Tom Morello said, “He stepped to the microphone and sang the song and I couldn’t believe it. It didn’t just sound good. It didn’t just sound great. It sounded transcendent.” From that day Audioslave was born. 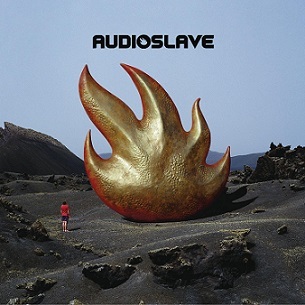 Today we’re listening to Audioslave’s self-titled debut album, which was released in November of 2002. After selling over 100k copies the first week, the album was certified gold within a month. By 2006, it was triple platinum. Given the timing, pirated music was probably at an all-time high at the time, so the album exploded onto peer-to-peer sites, often with the album being in an unfinished, leaked form. This caused great frustration within the band, because the whole project was to be kept under wraps. Cornell was also battling alcohol addiction at the time and checked himself in rehab. After recording but prior to release, the band cancelled their tour dates (with a huge show at Ozzfest) and officially broke up. Thankfully, Cornell bounced back from rehab, got his personal life together and six weeks later, all was right with the group. Super groups are tough—as a big fan of both Rage and Soundgarden separately, I’m not sure I’d have agreed the two bands could more or less merge, and come up with a good sound. What I’d have underestimated though, is both sides completely departing from their original sound and coming up with something that’s a total throwback to mid-‘70s rock. This isn’t alt-rock and it isn’t hard rock with a political undertone. It’s straight up, in-your-face rock, which in the early 2000s wasn’t easy to come by. Cornell’s vocals are distinct, and anyone that knows Morello’s work can hear his solo work hiding in any track. For as quickly as this came together, they won a 2004 Grammy Award for best hard rock performance and have sold nearly 10 million albums worldwide. It’s hard to argue with that type of success. The band called it quits in 2007—but has recently hinted at a potential reunion. Audioslave’s story may not be over just yet. Anyone looking for a solid rock album will enjoy this today. I probably paid $10 dollars for it a decade ago and I have no regrets. Had I only paid $5, I might have been the happiest man on Earth.